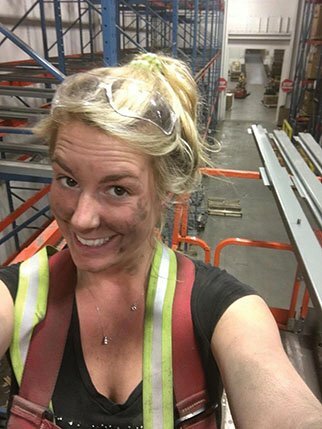 Jenna Brooks is the CEO of Racked Out, an almost four-year-old pallet racking installation company based in Mississauga, Ontario. Here’s the story of how this dynamic 25-year-old came to be installing racking and growing a business. It’s not the typical start to a business, and Jenna Brooks acknowledges that she was simply trying to earn a better wage as a maintenance worker in a warehouse facility when she started working for herself. But once she registered her business and began earning double the money, suddenly the work began to change. In fact, Racked Out employs 18 people now, and works on up to six or seven projects a week. 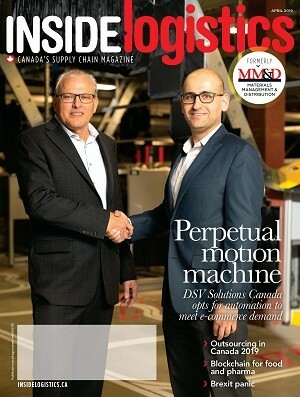 Clients include FedEx, Menasha, and Nobel, with projects all over southern Ontario. As any small business owner knows, there are numerous challenges in getting off the ground and growing. Right now Brooks says, being taken seriously, along with buying power and staffing are her biggest hurdles. She recalls numerous times when she’s had to fight to even get a quote for rack when she’s bidding on a job. We asked if being a woman is part of the challenge. Brooks plays up the feminine, using hot pink as the company’s branding colour. But it’s not just about being a female-owned company. She supports breast cancer research and wants to become involved with helping women in the community. “We can emphasize the pink, just being strong women role models and entrepreneurs in this society,” she says. “I always knew I was going to be successful,” she says.